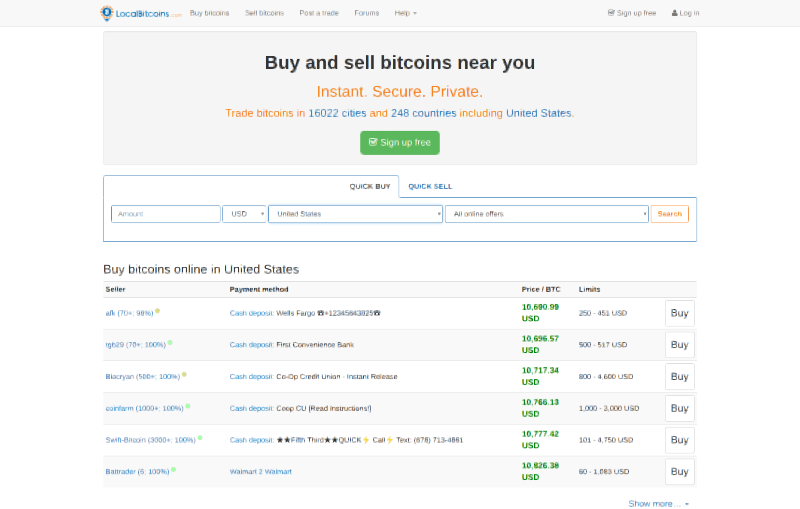 LocalBitcoins was one of the first peer-2-peer Bitcoin exchanges, established in 2012. 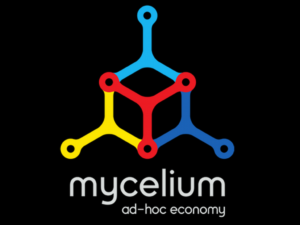 Their trading platform allows buyers and sellers of Bitcoin to connect and privately trade with one another. LBC is now the most popular P2P Bitcoin trading site, and one of the most popular Bitcoin exchanges in general. The company is located in Finland, but accepts users from over 240 different countries worldwide, including the United States. In September 2017 it was reported that they had approximately 350,00 active users. LocalBitcoins is an online platform that allows buyers and sellers to post advertisements on their website. Users can search through these advertisements based on their preferred payment method, price range, and other transactional information. The platform utilizes a feedback system where users can leave either a thumbs up or thumbs down after each exchange along with a review. Feedback is calculated as a percentage, based on the number of positive and negative ratings for each user. This system lets members view the feedback score and reviews of any user they are considering placing a trade with. Once the buyer or seller finds a trade proposal (advertisement) that meets their criteria from another user with positive feedback, they can communicate with the person who posted it to finalize the exchange. A trade can be finalized either online or locally via a vast number of payment options (outlined below). LocalBitcoins supports 45 different types of payments, and they are always adding new options. These include various types of gift cards, cash, bank deposits, Chase QuickPay, Venmo and PayPal among others. This is more than most centralized Bitcoin exchanges, however, some of the payment options are more prone to fraud. For example, they accept things like WalMart gift cards, credit cards and Western Union money orders which tend to be high risk. To lower the risk of fraud, or even potentially transacting with someone who’s funds are associated with illicit activities, you should try to use low-risk payment methods. For the first several years of operation, LocalBitcoins only supported one cryptocurrency; Bitcoin. Aside from fiat currencies, they now also support five popular altcoins for both buying and selling. Since 2012, LocalBitcoins has been steadily expanding their platform to support new cryptocurrencies and users can now buy or sell Bitcoin, Dash, Ethereum, Ripple, Litecoin and Monero. What separates LocalBitcoins from other P2P exchanges is their escrow system and conflict resolution service, which was implemented just a few months after they launched in 2012. Once a seller receives their funds from the buyer, the escrowed Bitcoin is released to the buyer’s LocalBitcoins wallet. In cases where a seller fails to release the funds for whatever reason, LocalBitcoins has a conflict resolution service. If there is ever a dispute or disagreement, the resolution team will investigate your case. If they find the seller was in the wrong, they have the ability to release the funds to you from escrow. This means that users can trade with confidence. If you want to buy Bitcoin, Dash, Ethereum, Ripple, Litecoin or Monero on LocalBitcoins you can do so by either searching through advertisements or creating your own ad. To find an existing advertisement, you can start by using the search bar on the homepage under the “Quick Buy” tab. You can filter by currency, amount, payment method and country. This will display all of the results available that meet your criteria, and you can sort by the seller’s rating, price and trading limits. Once you find a suitable trade, you will have to finalize it on the advertisement page by reviewing the terms of the trade. If you agree to the terms, just enter the amount you want to purchase and proceed. Then, send the payment via the details provided by the seller. After the seller confirms receipt of payment, they will release the coins to your LocalBitcoins wallet. From there you can transfer your new funds to your personal wallet. When you want to sell cryptocurrencies at LocalBitcoins, it essentially uses the same process as buying. There is a “Quick Sell” tab if you want to search through other users’ advertisements, or you can post your own. If you’re creating your own ad, the specifications can include price, the amount of crypto you want to sell, and payment type. “As of August 8th, 2015 the state of New York put regulation 23 NYCRR 200, known as the BitLicense, into full effect making it a federal offense to sell virtual currency to New York residents or businesses without a license. To avoid getting scammed by users on LocalBitcoins or unknowingly accepting fraudulent funds, you should always try to transact with traders who have a 100% rating when possible. You should also try to exchange with established accounts that have been trading for a year or longer. You can view the age of an account and their feedback rating on the advertisement page, or by viewing a user’s account. LocalBitcoins.com is owned and operated by LocalBitcoins Oy, located in Helsinki, Finland. The company was started in 2012 by Jeremias Kangas, and his brother Nicholas Kangas also got involved with the company early on. Nicholas would go on to become the CEO of LocalBitcoins until 2017 when Jeremias took over.